Remembering Part 1 of my Singapore and Malaysia trip, I last mentioned about our visit to Sentosa. I already miss riding the Luge, doing the zipline, and killing time by people-watching at the different beaches there... and how I really loved the 'Songs of the Sea' show. Left: Houses made of wood that are built on water - view before the show starts. Right: At the end of the show is a wonder fireworks display. 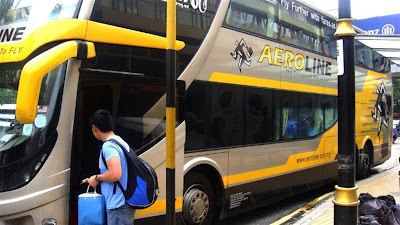 On the night of our third day, we were already in transit to Genting Highlands in Malaysia via the Transtar premium bus (SGD 44.29/pax), which we booked online. We had to travel from Sentosa to Lavender MRT Station, because boarding and check-in is in this area. Our trip started its journey at 10:45PM. We didn't have to bring our whole luggage bag with us, because we had it stored in our hostel for SGD3 per 24 hours. Convenience indeed! By 5:45 in the morning, we finally got to Genting Highlands. It was raining that morning and the weather was freezing cold. 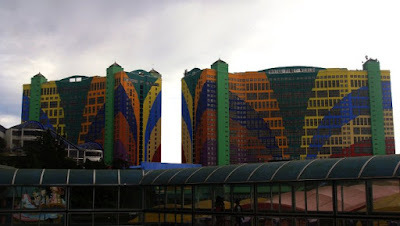 We were quite unsure of what to do and where to go, so we headed to the lobby of the colorful First World Hotel (pictured below) to kill time, take a short nap, and just think of what to do that day. I only had MYR26, which I borrowed from a friend before we left Manila. Only that, some Peso and SGDs, we were hoping to find an open money exchanger that early (and especially that it's a Sunday). We failed, of course, but we saw an ATM from which we withdrew some amount of money. Seeing only McDo and KFC open, we opted to eat KFC again and waited for the theme parks to open. Glad there was free WiFi there. We only bought entrance tickets for the Outdoor Theme Park, since we were not much interested with experiencing the one indoors. By lunch time, we have already completed the thrill rides and thought that it's just another Enchanted Kingdom of Manila. Lunch quickly followed, then a 1.5hours bus trip to Kuala Lumpur next. Even without going to the actual area, the tall KL Tower can already be seen in the place where we chose to stay. There were lots of restaurants, malls, and tiyangge stores all around us, but I didn't buy much. What's Malaysia without the pictures of the Petronas Tower? We decided to take a picture of the building on the same night, since it's closed the next day (Monday). We didn't get to enter the tower, but it's all good! We spent about an hour taking tons of photos from different angles, but I guess it really takes one to be a photographer in order to come up with good shots. Tee-hee! The highlight of the night, for me, was not seeing Petronas, but the massage I was looking forward to for the whole trip. MG said Reborn Massage has a great service, so we tried it out. I know we deserve pampering for all those walking since Day 1. It was so worth it! We didn't have anything planned for the 5th day, so we just roamed around the malls nearby trying to buy stuff for ourselves and our loved ones. Mall-hopping from one to another until we reached Suria KLCC to kill time and wait for our 6:30PM bus ride back to Singapore. Pictures above are care of National Geographic's exhibit area in one the malls in Bukit Bintang. We booked Aeroline online for MYR60.77 per person. It was super comfortable - reclining chairs, blankets provided, meal included, has comfort room, has individual earphones for music and audio of a movie, has a bus "conductor" to assist us. You would need to go to Hotel Corus to check-in for Aeroline. Arriving back to Singapore at half past eleven in the evening, we hurriedly walked to catch the last train back to our hostel. Luckily, we made it on time! Bravo! We didn't have to take a cab and spend more that night. On our last day, MG and I split up -- he went to see his friends and colleagues, while I do my electronics shopping. Aside from being able to buy the Philips electronic shaver back at Mustafa Center, Sim Lim Square gave me a good deal by offering the Shure SM58 microphone with wire for a price I couldn't resist (huge price difference than here in Manila). The time has come for our trip to end. Without much money left, we rode the MRT and bus to reach the Budget Terminal, where we patiently waited for our boarding and departure. For me, Singapore is really a first-world country with a fast-paced life and an awesome train system. On the other hand, I think Malaysia needs to be visited separately, but perhaps trying out the other states like Penang or Kota Kinabalu would be better. Overall, it was a great trip coupled with new experiences and happy memories. 'Till the next!